Despite being published back in 1984, I only found out about THE TV SCHEDULE BOOK this year. So - of course - I had to order myself a second-hand copy. 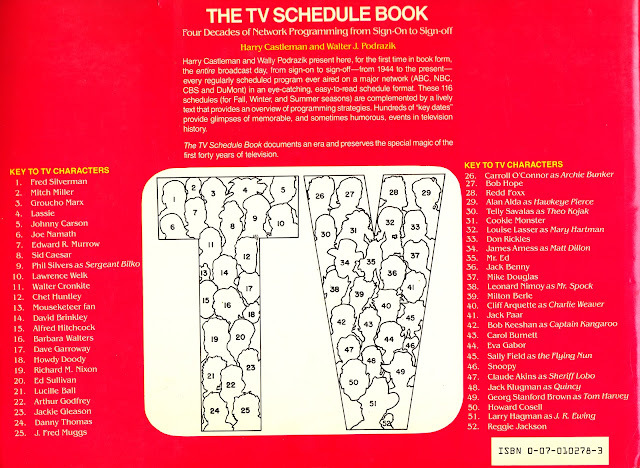 It's basically a hardback book of US TV schedule grids, showing which programmes sat in which primetime slot each season. 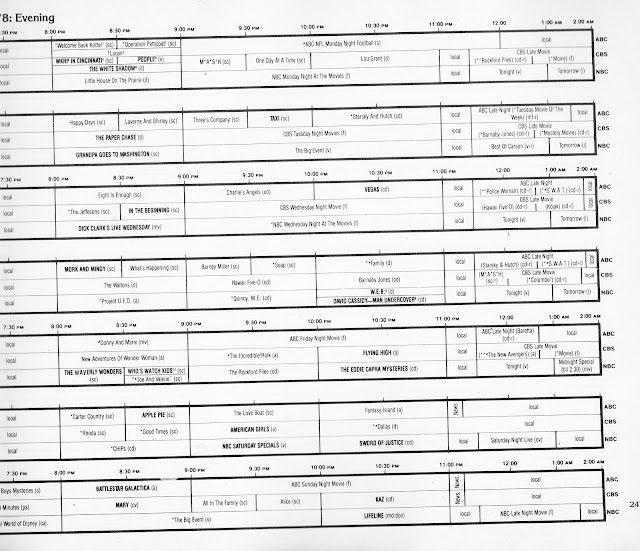 Not only can you find your own favourites, but you can see the show's they were scheduled against. 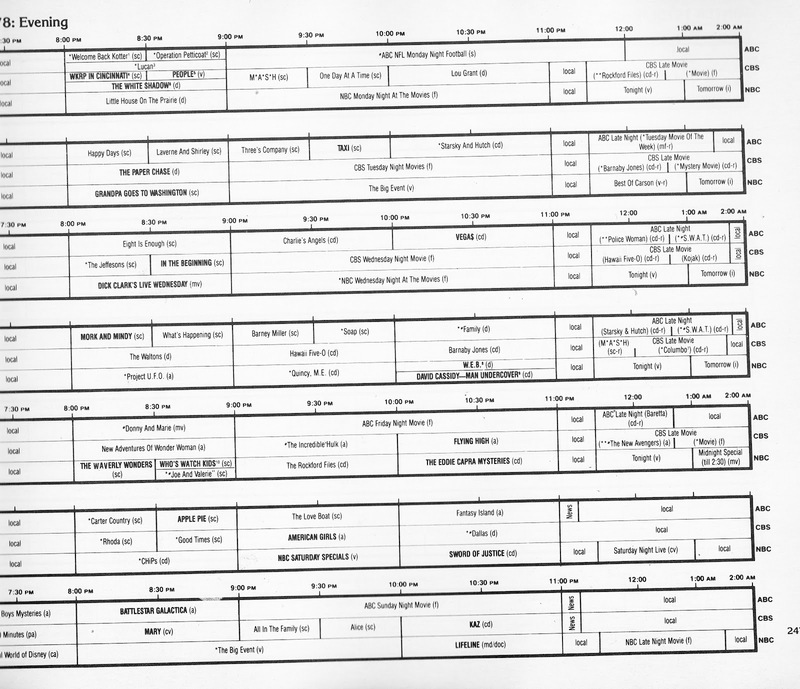 It's completely geeky, and I don't really know how accurately it could possibly reflect week-by-week schedule changes, pre-emption's, cancellations and other hasty programme shuffles so beloved by ratings-desperate TV schedulers... and hated by viewers forced to chase their favourite show across the week. Nevertheless, it's also a rather neat - if ultimately pretty pointless - historical document. It's probably more fun for US readers of a certain age who'll be able to recall frustrating schedule clashes, shows-long-forgotten (and possibly much loved) and growing up with the box. As far as I know, there's never been an attempt to create a British equivalent. With less defined seasons, more one-off programmes and shorter seasons, I imagine it would be something of a nightmare to compile. I thought it would be useful to reproduce one - ahem - random interior page to demonstrate how it worked. 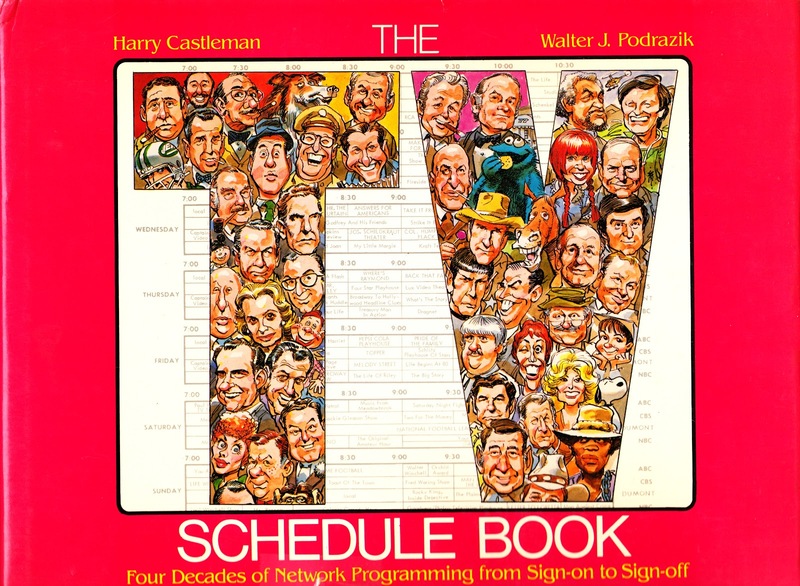 Of course, I just happened to settle on the Fall 1978 season... with a certain show sitting in ABC's Sunday night at 8 slot. Apologies for the slightly wonky scan, the book's binding made it a little tricky to get it under the scanner hood.